Boca Grande is one of those incredible little towns where you have always dreamed of disappearing to. It's a place you can get lost wandering on the seven pristine miles of sugar white beach or exploring the back bay during low tide. 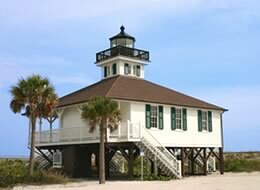 Located on the Grande Barrier Island, Gasparilla, situated half way between Fort Myers and Sarasota, Boca Grande is a postcard of what island life in Florida was meant to be. In your vacation rental condo or home your senses will be awakened by the brightness of the night stars, the rush of the surf and the sweet smell of the salty air. Boca's casual style and shops are full of unique treasures. Galleries with works of local artists, restaurants featuring the freshest local seafood, coral streets lined with 80-year-old Banyan trees are irresistible. As well, the 104-year-old lighthouse will bring you back over and over again. Just by chance, if you haven't been sold on Boca Grande Florida as the perfect destination for your vacation, perhaps the thrill of plentiful year-round fishing will convince you. Known as the "Tarpon Capital of the World", sports fishermen travel each spring to Boca's rich waters to participate in tournaments with grand prizes up to $100,000. If you're looking for spectacular sunsets, natural beauty and somewhere to fall in love with, then you have found the perfect place, Boca Grande.